NEWPORT BEACH — The ribbon to the largest West Marine on the West Coast has been cut, and the store is now officially open. The location kicked off its grand opening Oct. 3 with “Cruising for a Cause,” a fundraiser to support local marine-related nonprofit groups. Guests were greeted with leis, the calming island tunes of the Reef Brothers and hula dancing. Around 700 attendees enjoyed appetizers, a raffle and a live auction hosted by the star of the Bravo reality television show Below Deck, Capt. Aleks Taldykin. While tickets were only $10, the event raised more than $18,000 for local nonprofit organizations, including the Leukemia and Lymphoma Society’s Leukemia Cup, Orange Coast College’s Professional Mariner Program, the Newport Beach Chapter of Surfrider, UC Irvine Sailing Association, Newport Harbor Sailing Foundation, Aloha Kai Research Foundation, Newport Aquatic Center, Balboa Yacht Club Junior Sailing Program and Friends of Rollo. The Thursday night opening gala — and the first day of operation for the new store — also provided a moment of analysis for West Marine employees. “Thursday wasn’t a pure study, but we took some observations,” said West Marine CEO and president Matt Hyde. Employees watched as customers navigated the store, observing what products caught their eyes first, and where their attention was focused. “What we’ve noticed here is that people love to recreate on or around the water,” Hyde said. Hyde, whose second most recent store study was done in Anchorage, Alaska, noticed major differences in consumer behavior. And with a Newport Beach lifestyle in mind, West Marine’s new Lido location has been set up differently from the company’s other stores — having apparel and sunglasses as the first things that meet customers’ eyes when they walk into the store. The location boasts more than 150 different kinds of shoes, including a pair of Gold Cup Sperry Top-Siders with 18 karat gold eyelets, and 40 different types of sandals. Boating electronics have been given their own department that is larger than many stand-alone marine electronics stores. It is designed for hands-on customer comparisons, with more than 100 products on display — hooked up and ready to try out. There’s also a complete rigging shop, with line, hardware and an expert staff ready to offer advice. Custom orders will be filled here, and the large rigging shop department will serve customers nationwide. This West Marine store also offers a large parts department, with a separate entrance for pros to come in and get what they need. And the Lido West Marine flagship store aims to cater more fully to local sport anglers, adding a large tackle store department — stocked with a huge array of rods, reels, lures, line and gear targeted toward specific SoCal fishing needs. “We haven’t really been in the fishing business before, but now we hope to fill that gap and create convenience for clients,” said store manager Chris Beckwith. 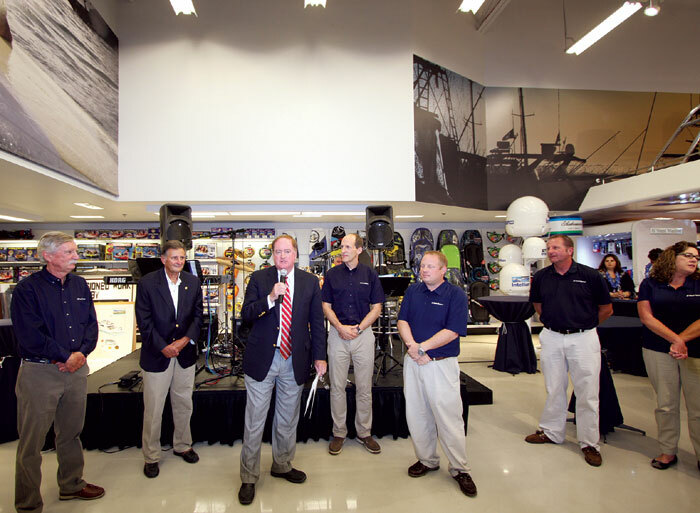 Throughout the grand opening weekend, store visitors were treated to a variety of free boating and fishing seminars, marine electronics presentations and a coastal lifestyle fashion show, plus food and entertainment. The event attracted numerous enthusiastic attendees. However, no one could have been more excited than the man who started the business, selling rope from his garage 45 years ago. After thorough study, surveying the wants and needs of Newport Beach area customers, the Lido store was specifically designed with its local clientele in mind. “We wanted to know what people want,” Repass said. One thing he’s sure they want is a cleaner engine — and the grand opening showcased two lines of new outboard engines that run on electricity and propane. “The propane engine is amazingly popular,” Repass said. “Propane is clean, and (the fuel) doesn’t foul your engine,” Repass said. The new Lehr propane motors are 50 percent more fuel efficient than diesel engines and they have been garnering much praise from industry experts. A Lehr propane engine was set up in a clear tank for demonstrations, and it was revved up for curious customers throughout the weekend. The new West Marine flagship location, located at 3433 Via Lido, covers 27,500 square feet and offers more than 18,000 products. It is three times the size of a normal West Marine store, which is 8,000 square feet.